Tik Tik Tik audio launch: The film starring Jayam Ravi, Nivetha Pethuraj, Jayaprakash and Ramesh Thilak among others has music by D.Imman. 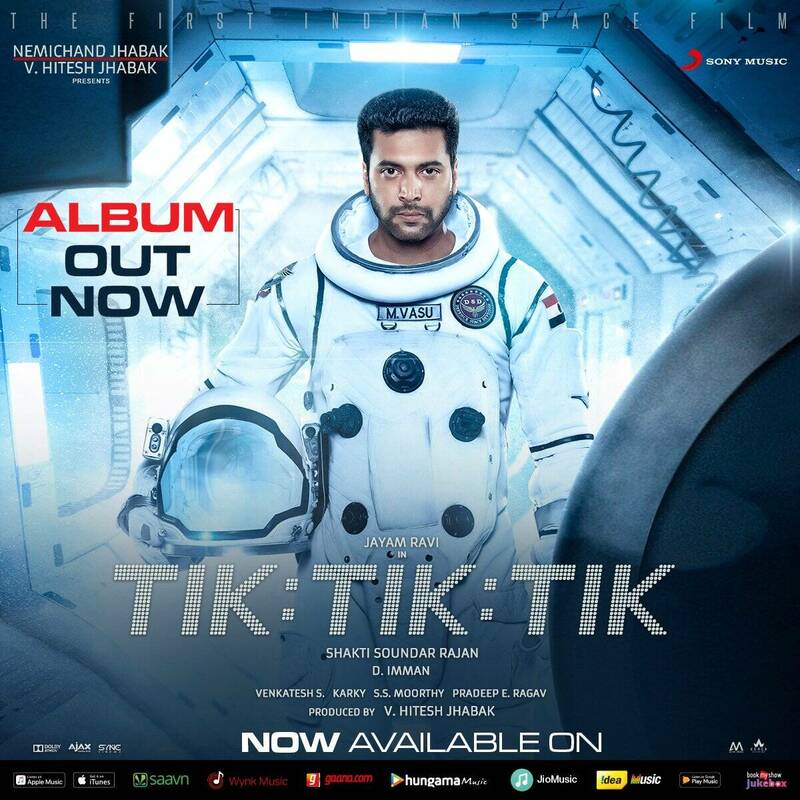 Tik Tik Tik, touted to be India’s first Space film, also the music composer D.Imman’s 100th film. The music album of Tik Tik Tik, touted to be India’s first Space film, was launched on Thursday with the entire cast and crew in attendance for the event. The film starring Jayam Ravi, Nivetha Pethuraj, Jayaprakash and Ramesh Thilak among others has music by D.Imman. Incidentally, the film is also the music composer’s 100th film. Tik Tik Tik has three songs — the title track, Kurumba and Vinveera. The title track has been sung by Yuvan Shankar Raja and Sunitha Sarathy. Kurumba has been sung by Sid Sriram where as Vinveera has been voiced by KG Ranjith and Sri Rascol. Talking about the film, director Sakthi Soundar Rajan said that the CG was completely done in Chennai by a company named Ajax, calling them the hidden heroes of the film. 90% of the technicians who have worked on the film belong to Chennai. The film is said to be high on action and breathtaking visuals with extensive sets made for the film. In fact, when talking about the film, the film’s leading man Jayam Ravi said that the film has to be watched in theaters for the complete experience. Talking about Nivetha Pethuraj, Jayam Ravi said that the actress has several skill sets that will take her places. “She is a fitness freak. She has also suffered several injuries during the shoot. But her prime concern was always getting the shot right,” said Ravi. Nivetha is playing a space agent has performed all the stunts herself. “Shakti sir saw me once for 5 minutes and decided to cast me in the film. I wanted to be true in whatever I did as he trusted me. It was tough to perform stunts but the team is a fun team. Thus, it balanced out. I’m sure Tik Tik Tik would prove to be a big break for me,” said Nivetha. After making Kollywood’s first Zombie film, Shakti Soundar Rajan is now helming India’s first Space film. “Not many people attempt a full space film in Asia due to several productional constraints. I have to thank my producer and Jayam Ravi for backing me,” said Shakti. He also spoke in high praise about D Imman, the film’s music director. “Imman sir had given me the complete score during a Christmas for a film that is releasing on Republic Day. It is amazing to see someone be so professional even after 100 films,” added Shakti. Tik Tik Tik has a running time of two hour ten minutes and is hitting the big screens on January 26. 1 Yuvan Shankar Raja walks out of Ajith's Viswasam?